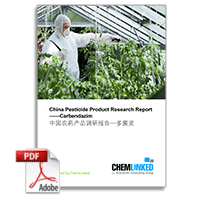 Even though it has been produced and used in china for more than 30 years, Carbendazim is still a popular fungicide. The production capacity is 50000 tons per year. More than 400 manufacturers hold a total of 942 valid registrations of product containing Carbendazim as the active ingredient. Most registrations have the formulation code: WP. WP is an outdated formulation code which will be phased out in china. The production method using Cyanamide as the start raw material to synthesis Carbendazim will be phased in. Market demand for Carbendazim is not solely from the agricultural sector as the chemical is also used as an industrial preservative.